he house located in the middle of St.Nicolas Bay, where on the left side of the bay is the port of the island (1klm). 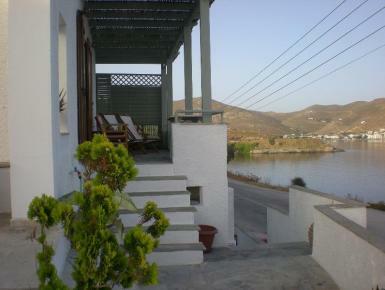 Also 300m on the right of the house the marina of the island starts. Marina is also the most tourist area of the island. The view from both balcony and patio is supperb. Inside there is a big living room with open kitchen, together with the dining room. There are allover windows, and a French window that allows the visitors to use the balcony. The balcony-west facing, ideal for sunset- accommodate easily a lot of people in the approximately 20sm.